When I travel, I love to try new food and restaurants, something I wouldn’t (or couldn’t) get at home, with the added bonus of no dishes! But sometimes it’s nice to have a home cooked a meal in your comfy pj’s after a day out exploring a new place. ​At home, many of us already shop at a local farmers market, why not when you’re on vacation? 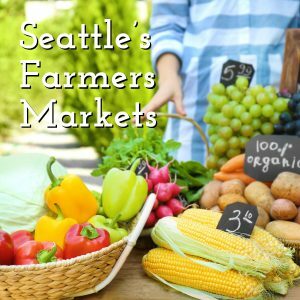 A new place means new farmers and artists, and is there a better way to get fresh, organic produce, meat, and seafood than to get it right from the source? I think not. Address: 1st Ave and Pike St. Hours: 3:00 p.m. – 7:00 p.m. Hours: 3:30 p.m. – 7:30 p.m. Address: W. Crockett St. & Queen Anne Avenue N.
Hours: 3:00 p.m. – 7:00p.m. If you love to cook, our luxurious vacation rentals are fully stocked and ready for whatever culinary adventures you dream up. From pots and pans, to spices, to serving dishes, we’ve got you covered! Let the team at Seattle Oasis Vacation Rentals will help you book an amazing property for dinner with a skyline view and stylish amenities customized to your specific tastes. Contact us to start planning your next trip!